The dude in the red shirt syndrome. Made famous by those doomed extras on the original Star Trek, this malady attacks anyone who takes routine matters for granted. And that never bodes well. So why'd he stand up with his phaser drawn, then? That's not diligence. That's asking for it. In the present, Missouri's hoopsters just learned this lesson the hard way. Click over to The Daily Player and appreciate a heads-up dude who taught it to them. Who thinks of this stuff? Then again, who cares? It's brilliant! And for $29.99, it's irresistible! This is how quality adult beverages are to be toted at tailgate parties! So limber up your clickin' finger, head to checkout, and prepare to be the dude or dudette who's there with the spare ... or hands free to help exaggerate that next big story you're gonna tell. 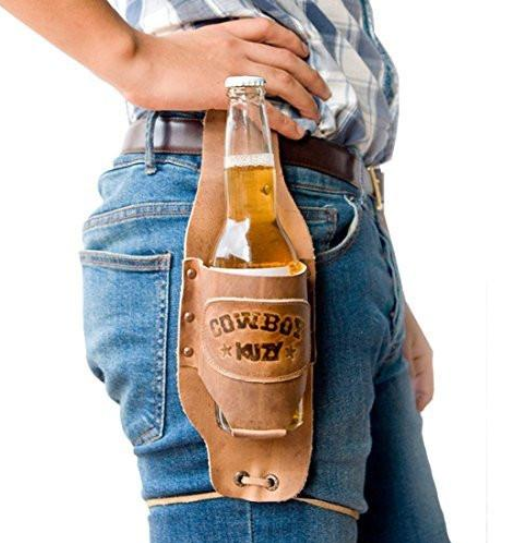 And really, if you're worldly enough to come to the party with this novel holster, why wouldn't anyone believe you?